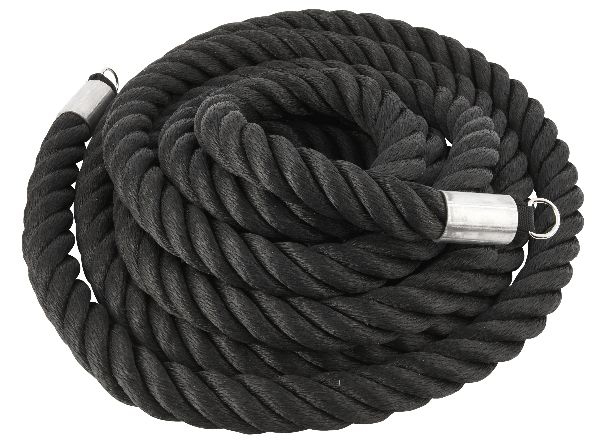 Click here for quality battling ropes for a great price! Battling Ropes are a great tool for both elevating heart rate and burning calories and building muscular endurance. John Brookfield, a world renowned strength coach and strongman with many Guinness Book of Records strength feats, invented this simple training tool. Within years of his invention, many professional athletes (especially in MMA, NFL and NFL) are now implementing battling ropes to their conditioning programs. Battling ropes are made of manila or polyester and are typically 40 to 100 feet in length and have a diameter or 1.5 to 2 inches . However, beginner and intermediate athletes will use a 50 foot rope with 1.5 inch diameter and well conditioned athletes will use a 2 inch rope. Using battling ropes is a great challenge for your whole body, especially your back, shoulders, rotator cuff, arms and core. Well conditioned athletes who begin rope training may typically only be able to perform explosive sets lasting one minute. This challenges your anaerobic system to the limit. The muscles of your shoulders and arms will feel an intense lactic acid burn like never before. Unlike using a fixed weight, the athlete determines the intensity by the speed of the waves created by the rope. For beginners, it is recommended to perform :45 to 1:00 work sets followed by :30 to :45 rests. Try to increase your work set time for more aerobic training. Battling ropes are for men and women who you are looking to tone their upper body and lose fat. Hit the legs as well by performing squats or lunges while creating waves. Battling ropes training sessions should be performed after weight training or as a separate training session alone. Another benefit is that with battling ropes there is very little risk of injury. They are a great portable and versatile fitness tool that can be brought outdoors. Just anchor the rope to a pole or tree and you are ready for one fun and awesome workout! Add a new dimension to your regime with this piece of equipment. This exercise can be perform with underhand or overhand grip. Underhand grip waves target the core, shoulders, and biceps. Overhand activates the triceps more. Keep your core braced throughout this movement. This is a great exercise that torches the chest, back, and shoulders. 45 seconds of this is more than enough. It is similar to a combination of chest fly and reverse fly. Keep your core braced and knees bent. Hip Tosses primary targets are shoulders, back, abs, obliques. More Battling Ropes Videos Coming Fall 2018!